Provide an option to divide all data items: emails, contacts, tasks etc. Many of you must now be thinking that how to split huge PST file? So, follow the smart route to split large Outlook data file by PST Split Software, which is a simple and intuitive tool to divide PST file of any size. PST splitter software is fully equipped with state-of-the-art features to break Outlook PST and uses cutting-edge technology to split Outlook PST file so as to offer you a great experience of performing the process to divide bulky PST file. We are not boastful but confident enough that if you use our tool for Outlook split PST files process, you will gather utmost satisfaction. With the help of Outlook PST split software, a user can split large size PST file into smaller parts. Moreover, a user is allowed to divide both ANSI & UNICODE type PST file without compromising the integrity of data. Apart from all this, it preserves the Meta properties of data even after splitting PST into smaller parts. The Split PST software is designed in such a manner that it provides users an option to divide large PST file by date. A user just needs to select the date and the tool will divide Outlook PST by date into two parts. One part will keep the data 'of & prior' to that particular date while another part will contain data 'after' that date. 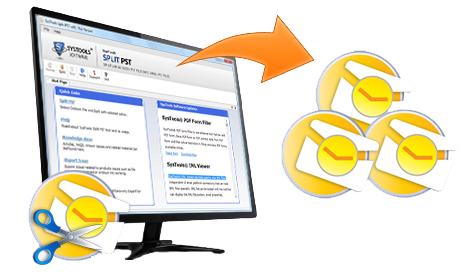 Another option offered by PST file splitter software is split large PST file by size into multiple parts. This option will use a common size for all. One just needs to mention the size of PST file from a range of 5 MB to 10 GB. The application will divide large PST file of Outlook into smaller parts according to that only. Sometimes users want to divide Outlook PST file by year, in that case this application is very helpful as it provides Split PST by year option. Using this option, a user can create a PST file for each year separately. For example, if a user chooses year range from 2011 to 2015, then the tool will create total 5 PST files i.e. one for each year. This option let users create a separate PST file for each folder by size. The PST file splitter will make a single PST file for each folder in main Outlook PST file. After that, it split the respective folders by size as specified by the user. For example, Inbox.pst (for the inbox folder), Outlook.pst (for the Outbox folder), and contacts.pst (for contacts folder), etc. Another important feature of this PST Split software is that it permits users to divide archive.pst file or folder. It renders users an option to split Outlook data archive by size, by year, by date or by folder. This will make it easy for the users to manage them after importing it successfully to Microsoft Outlook. The best part of Outlook PST file splitter tool is that break PST file into smaller parts and avoid all corruption issues related to large PST file. If PST file is growing large in size, then a user just need to split it by year, date, size, or folder. It will prevent the 2 GB PST file size limit issue in ANSI PST file. As the PST file splitting process completed successfully, the tool will generate and saves a comparison report in CSV format. This report will include all details of the split process such as the name of a folder, no. of items in source PST files, folder path, total and difference of data items before and after splitting the Outlook PST file. To break PST files you can select Outlook format which you are using. The PST split software supports Outlook 2000, 2002, 2003, 2007, 2010, 2013 & 2016. Thus you need to specify the version & the software will automatically detect the format of PST file. Free Version: The free edition of Split PST software is available to download on the official website. It let users understand the working of the tool in a better way. This version will split only first 50 emails of Outlook PST file. Full Version: The paid edition of the PST file splitter has no limitation as in the demo version. A user can split PST file data by size, date, year, and folder without any restriction. In order to get the full edition, a user can purchase it directly from the official website. My PST file has been corrupted. Does the tool still cut PST file of size 20 GB? No, the tool does not split corrupted PST files. For this you have to first recover PST file & then only you can split up PST file. I have PST files stored in my system, but I have’nt installed Outlook in it. Can I still split large PST files? No, for splitting large PST files Outlook installation is mandatory. What all items apart from emails are splitted by this tool? The PST split software provides an option to split all items including emails, contacts, calendars, tasks etc. Can I add multiple Outlook PST files to the utility at a time? No, you can only add one PST file at a time for splitting purpose. "I was looking for the utility to split Outlook PST file by year and all search ends at PST File Splitter software. The application is designed in such an amazing manner that I did not find any difficulty while using it. All credit goes to the development team by doing such a brilliant job. Keep it up! !